Image caption Alex Salmond and Alistair Darling clashed over the currency and whether Scotland could be prosperous post-independence. Alex Salmond and Alistair Darling have reflected on their head-to-head TV clash, ahead of the Scottish independence referendum. The Scottish first minister accused his rival of "shouting and pointing" during the two-hour programme. Mr Darling, leader of the campaign for a "No" vote in the 18 September referendum, said Mr Salmond failed to answer key questions. 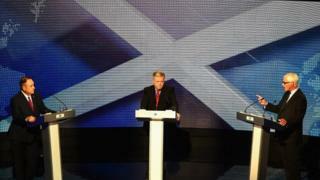 Both sides insisted their man came out on top in Tuesday's STV debate. Key moments of the debate included Mr Darling being asked 21 times if he agreed with David Cameron that it was possible for Scotland to be a "successful independent country". Mr Darling's repeated questioning of Alex Salmond's currency plans for an independent Scotland elicited the biggest response on social media, with more than 2,000 tweets during that segment of the debate. Speaking the day after the clash, Mr Salmond hit out at the former UK chancellor's debating style. "Shouting and pointing, trying to debate in that fashion is not what wins you elections or referendums," the first minister told the BBC. "To win, you've got to discuss and have a conversation with people across a range of issues - and in the immortal words of Zsa Zsa Gabor, 'macho men ain't mucho'." How to sum up the televised encounter? Today, away from the eager vacuity of spin, Alex Salmond turned to a great icon of the 20th century for inspiration. Gandhi perhaps? JFK? Nelson Mandela? Not quite. Mr Salmond's guru of choice was Zsa Zsa Gabor. The FM's view of his opponent, Alistair Darling, was that macho doesn't prove mucho. Apparently, Mr Salmond reckons that finger-jabbing repetition of a question about "Currency Plan B" does not a debate make. Which, when you think about it, is rather intriguing, given that the common presumption in advance was that it was Mr Darling who should fear hectoring from t'other side. Mr Darling, a Scottish Labour MP, said he hoped the debate would help people make their minds up, but that, with six weeks to go, there was no clarity on what currency an independent Scotland would use. The Scottish government backs a currency union between an independent Scotland and the rest of the UK, which would involve keeping the pound, but Westminster party leaders said they would not support such a move. Mr Darling said: "Issues like the currency, issues that will affect people's lives, what they can spend, how much they can save - we need answers on that. "Basically, the nationalists are running out of arguments and they're running out of time in which to make those arguments." Following the debate, the Yes Scotland campaign for independence claimed Mr Salmond did more to win over undecided voters on whether an independent Scotland would be a fairer society. Media captionAlex Salmond repeatedly asks Alistair Darling: "Do you agree with David Cameron?" But Better Together, for the Union, said the debate highlighted Mr Salmond's lack of a Plan B on what currency Scotland would use if it could not retain the pound. Yes Scotland boss Blair Jenkins claimed Better Together's "Project Fear" style of campaigning meant they were unable to accept Scotland could be a prosperous independent country. He said: "So negative is the No campaign it seems that they have excised the word 'Yes' from any possible usage." Shadow foreign secretary Douglas Alexander, a leading figure in the Better Together campaign, told BBC Scotland's Good Morning Scotland programme the debate was a "hugely significant, perhaps decisive" moment in the campaign. He said: "It seems this morning that a new definition of scaremongering is asking the first minister a question he can't answer." A snapshot ICM/Guardian poll of 512 people immediately after the two-hour live debate found a majority thought Alistair Darling had fared better. Media captionAlistair Darling: "If you don't get a currency union what is it we're going to have instead?" More than 56% thought Mr Darling came out on top while 44% thought Mr Salmond won. However, Mr Jenkins insisted another ICM question showed Mr Salmond made greater strides at convincing undecided voters to back independence. A total of 186,267 tweets were sent overall throughout the show on STV. A number of people expressed frustration at technical problems that interrupted the broadcaster's live online streaming of the event. A second debate is to take place on the BBC later this month. Find out what Scotland's newspapers made of the debate.